General Hospital spoilers relate that poor Lulu is suffering from a horrendous case of emotional whiplash over at GH. First she’s reunited with the love of her life, Dante, and then he leaves, like, literally a minute later. Now she’s being plagued by what she thinks is another intruder in her house! What will she do? Of course, it’s probably just a false alarm, maybe it’s just Mom checking up on her daughter after Dante’s exit, or, maybe Kevin Collins had the bright idea to stop by and trigger the living daylights out of her, that would stand to reason because he does look exactly like Ryan. Oy! Either way, its time for Mom Laura to step in and be there for her daughter during this critical time, she even suggests that Lulu follow Dante to Wales, but Lulu will insist that she stay behind and let Dante have his space to battle his demons alone. 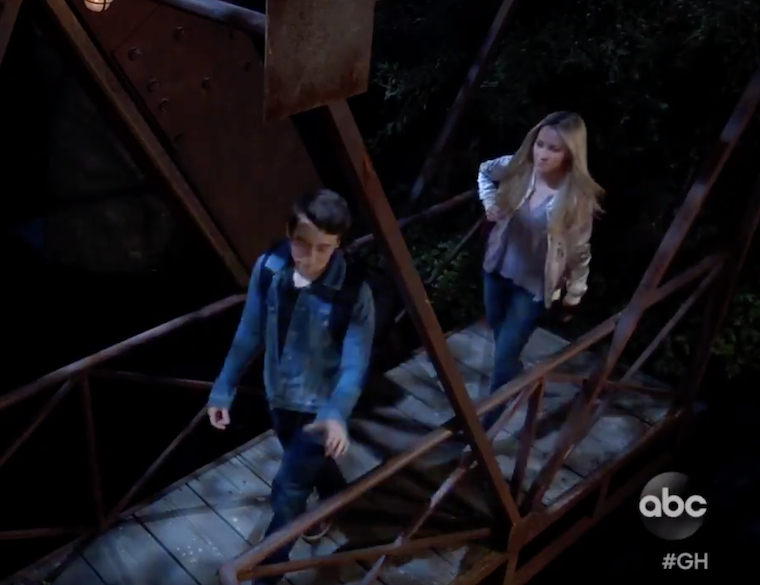 Remember that nice moment that Josslyn and Oscar were having on the footbridge? The one with the lock? Remember how sweet and romantic it was? Well, forget all about that because it all gets shot to hell when Oscar collapses on the footbridge, totally freaking Josslyn out. She gets on the phone and calls 911 for him immediately. Poor kid, he just wanted to have a few nice, romantic moments before he croaked, was that so much to ask? It seems like every time this kid leaves the hospital for more than five minutes his body freaks out. Geeze, how annoying for him! Meanwhile, his Mom Kim will stress out, and Julian will offer to be there for her. Curtis will run into Drew at the gym and inquire about Oscar’s condition. He will assure him that he has his back, and that’ll make Drew happy—at least for the moment. Right after that is when Drew and Kim get the call about Oscar and his latest seizure, they prepare themselves and head back to GH, expecting the worst. This is when we need one of those miracles that Shiloh was talking about, really! Laura talks to Kevin about their divorce papers, telling them that she got them from Alexis, but will it really be the end of the road for Kevin and Laura? After all, they still love each other, so they could hit the brakes on their relationship for awhile and just come back to it when Laura believes she can trust him again. Hey, stranger things have happened! We see Carly telling Epiphany that there are some things you don’t forget, whether she means her feud with Ava or her terrible encounter with Ryan, it is not clear yet. Speaking of Ava, she will have horrifying dreams about Ryan strangling her! What does this mean? Perhaps Ryan’s body has been found? If so, let’s please order a DNA test, salt and burn that body please so he won’t come back. But if he’s not dead yet, the Ava deserves the final confrontation—in honor of Kiki! General Hospital Spoilers: Steve Burton and Coby Ryan McLaughlin Take Jason vs Shiloh Rivalry Off-Screen, Shirtless Style – Vote Now For Best Shirtless Abs Photo In Our Poll! Meanwhile Jordan will get some news about her kidney dialysis, from Stella Henry. They won’t be good news though. It seems that Jordan will probably need a kidney transplant after all. Looks like no one’s catching a break in Port Charles anytime soon! Stay tuned!! !